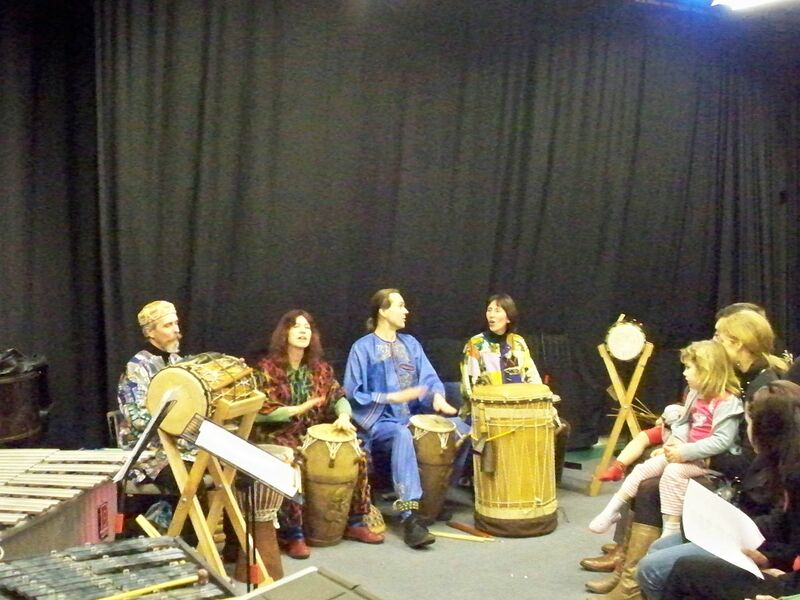 Bedford djembe group near Clophill - Drumming Is Fun! At last there is now For eight years until January 2018, there was an African drumming group near Bedford, where you can learn traditional rhythms from West Africa and sing the joyous songs they accompany. 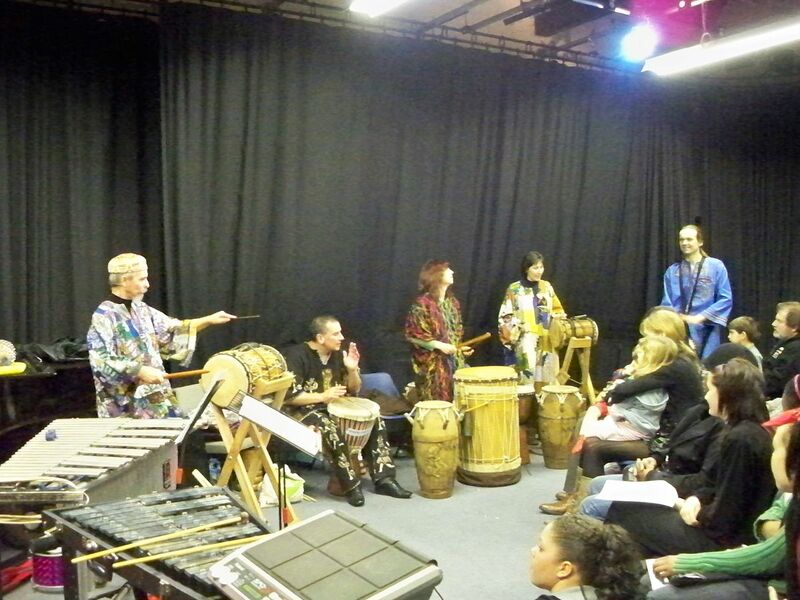 As well as djembe we play dun duns, Ghanaian drums and percussion. You can drop in any week, but you'll get the most out of it with regular attendance. Here you can see some of us performing in December 2009 as part of a Bedfordshire Music showcase concert, and below as part of Bedford Busking Festival in 2011. Other gigs include the Paralympics (which went ballistic!) and charity firewalks, as well as school concerts and fetes. In 2013 we rehearsed and performed at Letchworth Street Fest and Woburn Village Festival with Affinity Tribal dancers who added colour and flair to our performances! More recently we've played at Bedfordshire University in 2015 and at private parties. If you'd like us to perform at your event, please check our performance spec and then contact us with the date+time, location and type of event so we can give you an accurate quote. A typical 20-minute performance costs around £120 + travel costs. The Clophill Centre is easy to find, at MK45 4BT, on the eastern edge of Clophill (which is midway between Bedford and Luton), just after the white gates marking the end of the village. Sessions ended in January 2018; we are searching for a new venue. We meet on Tuesday evenings, with the classes for various levels starting at 7pm and ending at 10pm. We welcome new members any week, so come along when you can, at 8pm if it's your first time. We'll pause for a short break from 9-9:15pm to chat, so bring a drink if you like. 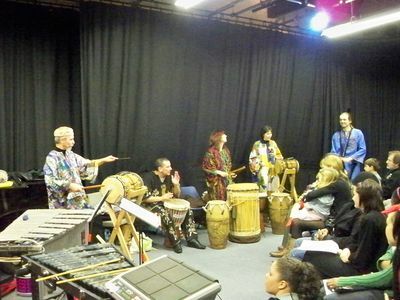 Any weeks where the class is not happening will be announced here and also on our (low-traffic) mailing list, so sign up for updates by sending me an email if you want to be kept informed of dates and other local drumming-related events/news. Here's a printable flyer if you have a noticeboard to publicise the sessions. This saves you money over the single weekly drop-in payment: basically the idea is that even if you can only make it to three weeks out of four, then it's still cheaper to subscribe. Plus, if you can't make it one week, you're welcome to attend my other group instead (at no extra charge to subscribers), as both groups run in parallel. Please note that payments are not carried forward to next month if you happen to miss a week (unless I have to cancel a session you paid for), but are just for the dates above.